A Japanese take on a Chinese dish, ramen is one of Japan’s most popular meals and ramen restaurants are found all over the country. 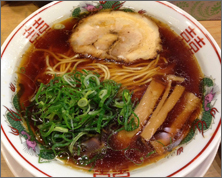 Usually made with a chicken broth and flavoured with soy sauce, shoyu ramen is the most common soup base and is usually what is served when the menu does not specify any other type of soup. This is a light, clear soup stock seasoned with salt. It is usually made from chicken broth, but may also be flavoured with other meats such as pork. 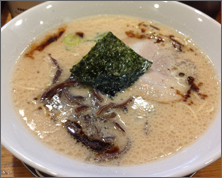 A thickish brown soup flavoured with soybean paste, miso ramen has a rich, complex flavor. 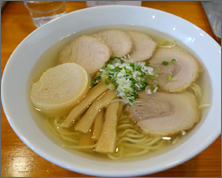 The style originally came from Hokkaido, where a heartier type of ramen soup suited the very cold winters, but is now available all over Japan. This ramen style comes from Hakata in northern Kyushu and is made of pork bones which have been slow boiled for many hours until they dissolve and form a thick white broth. The creamy soup is also usually flavoured with chicken broth and pork fat. 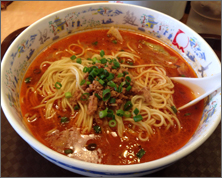 Usually a very spicy alternative, tantan-men is made with minced pork, soy sauce, sesame and chilli oil. The noodles themselves are made of wheat flour and come in several different types. Most are long and smooth but other varieties of varying thickness and can be straight or even wavy. Typical toppings for ramen include cha-shu (roast or grilled pork slices), negi (green onions), moyashi (bean sprouts), tamago (hard boiled eggs), menma (bamboo shoots) and various types of seaweed such as nori and wakame. 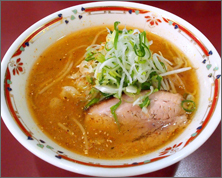 Ramen is available at many kinds of restaurants but we suggest going to a specialist ramen-ya restaurant. These are often located near train stations or entertainment areas but can also be very small spaces with just a few seats or even a pop-up type of yatai stall that only appears in the evenings. Some ramen restaurants use a vending machine system whereby the customer must first choose from a vending machine, which dispenses a ticket for the dish once payment has been made. This ticket is then handed in to the store staff and the chosen dish prepared. If you love ramen and would like to learn how to make it yourselves, why not include a ramen class as part of your trip to Japan!